Kellyanne Conway suggests men don't want their wives to work in the White House. 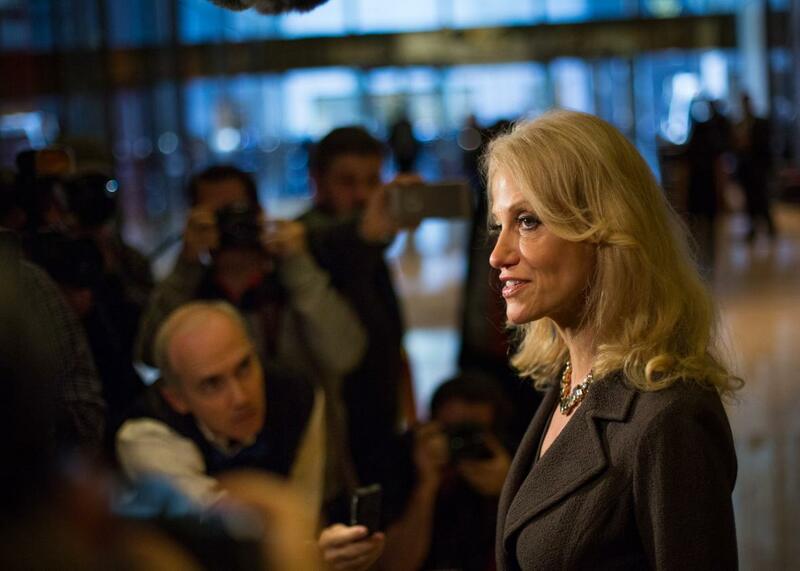 Kellyanne Conway takes press questions at Trump Tower on Nov. 16 in New York City. Update, Dec. 8, 6:20 p.m.: At the time we originally published this post, we made an interpretation of Politico’s report that may be too harsh in the light of new information. (The post’s original headline was “Kellyanne Conway Suggests That Women With Kids Shouldn’t Take Jobs in the White House.”) An ABC News report provided more context, including that Conway said mothers are “welcome in the Trump White House,” and that she said she intends to continue to work with Donald Trump as the head of an independent organization. As reluctant as she may be to work in a formal White House role, Conway does not seem to think that no mother should. ABC also framed her remarks below, about asking men if they want their wives to take White House jobs, as “ask[ing] the male candidates to see their role through the eyes of their spouse,” which is an interpretation we hadn’t considered. Original Post, Dec. 7, 5:13 p.m.: Donald Trump’s former campaign manager Kellyanne Conway said that mothers should not accept high-powered career opportunities—a standard that does not apply to fathers, in Conway’s opinion. Every parent—mother or father—is entitled to turn down a time-intensive job opportunity to spend more time with family, if he or she is in an economic position to do so. A full-time position in the White House undeniably infringes on a person’s family time, and anyone considering taking on such a role should take that into consideration when making his or her choice. The problem with Conway’s comments is not that she values her family or spending time with her young children. It’s that she seems to believe that it is the onus of the woman in a family to sacrifice her career opportunities so that her husband may have his. Even more troubling, Conway implies that no good mother should take on such a job—an attitude that feels ripped out of Mad Men. As long as women are expected to sacrifice their careers for their families and men are not, the glass ceiling in the workplace isn’t going anywhere. Appearing on the Daily Show with Trevor Noah on Nov. 30, conservative pundit Tomi Lahren asked why liberals have not lauded Conway as a feminist icon for being the first successful female campaign manager. Conway’s double standard for mothers and fathers who work is a good example of why.